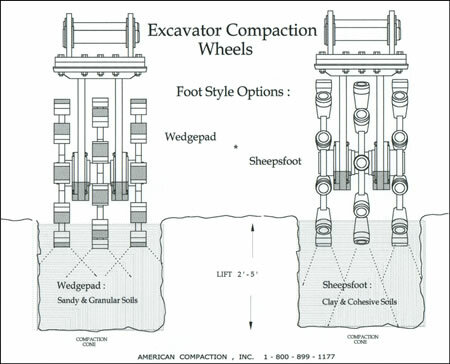 Compaction Wheels, Skid Steer Wheels, Excavator Wheels, American Compaction Equipment, Inc. The one unique feature that makes the "WHEEL" so effective is its' "OPEN RIM" design. 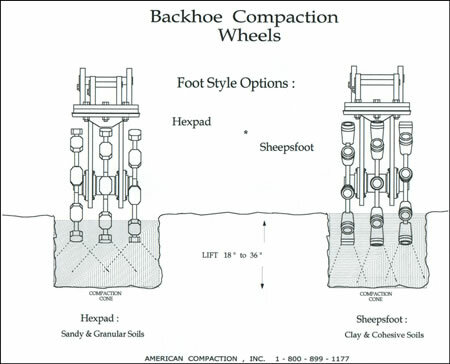 The wheel is able to penetrate through the lift of trench fill and compact the soil from the bottom up rather than the top down. 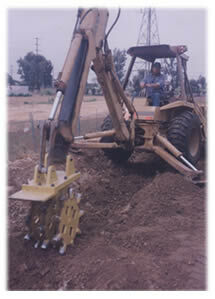 The equipment operator, after using the "WHEEL" for a reasonable amount of time, can normally tell that he has reached his required compaction by the feel of the wheel in the ditch through the hydraulic controls of the machine. 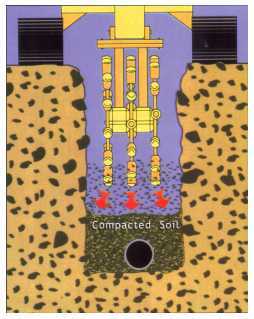 Six to ten passes should be sufficient to achieve 95% and greater standard density in normal soil conditions. ** The Diamond Compaction Wheel, requiring no special hydraulics or systems for power, can increase compaction productivity by 75% or more. 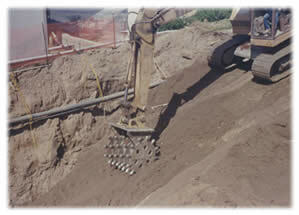 ** The Diamond Compaction Wheel can increase and promote job safety with the elimination of men working in the trench. ** The Diamond Compaction Wheel adds versatility to existing equipment already on the job, while reducing the need for high maintenance conventional compaction equipment. ** American Compaction Inc. has provided Diamond Compaction Wheels, service and technical assistance since 1987 and continues to offer the same today and for the future.